We’ll work with your executive, key staff, board members, etc to help you establish a new dues structure designed specifically for you. Let’s dissect your membership and look for the gaps. There are always places where you are missing an opportunity and this is the session for that work!! Intensive training on membership sales intended for your sales staff. We’ll work on researching & identifying key targets, understanding generational differences in member recruitment, selling benefits instead of features & more. We’ll work with your marketing team on improving your branding and marketing efforts & help you create a new Social Media Ambassador Squad (part of your traditional Ambassador team) that will create additional buzz about your organization. Is your organization prepared for the largest shift in human capital this country has ever seen? We’ll work with you and your team to make sure you understand the generational differences between the Boomers who lead your organization today, the Gen X’ers who are poised to take over, and the Millennials who are chomping at the bit! Are you utilizing Social Media to your best advantage? Are your members involved in your social media efforts? We’ll get you up to speed and ready to use all the latest networking and communications tools in no time! Are you an effective board? Do you even know what questions you should be asking as board members? This is the place to begin to make sure you are doing due diligence as the leadership for your organization! Are you looked to as the organization in your community that provides a training ground for developing and emerging leaders?? If not then you should be. 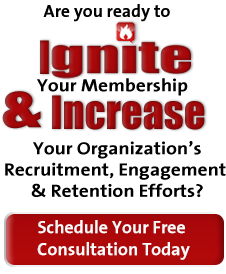 Let us help you expand on your existing leadership programs or work on developing new ones. Many times our organizations have a very homogenous look. Are you doing a good job of blending all aspects of diversity into your organization? Let us take a hard look at your structure and help you identify ways to freshen up your “look”!